Gum disease, also called periodontal disease, can range from simple inflammation of the gums, called gingivitis by dentists, to periodontitis, when the gums pull away from the teeth leaving open spaces that become infected. The bacteria causing the infection and the body’s response to the infection can break down the bone and connective tissue that hold your teeth in place. If periodontitis isn’t treated, the teeth may become loose and have to be removed. Gum disease can be prevented by regular tooth brushing and flossing. Gum disease has been associated with several other diseases, including heart disease, stroke, and diabetes. Past research has found links between gum disease and oral, esophageal, head and neck, pancreatic, and lung cancer, so researchers wondered if there were any links between gum disease and breast cancer. A study has found that postmenopausal women with gum disease were more likely to develop breast cancer than postmenopausal women who didn’t have gum disease. If the women had a history of smoking, the risk of breast cancer was even higher. The research is part of the very large Women’s Health Initiative Observational Study, commonly called the WHI. The WHI is looking for links between health, diet, lifestyle, and genetic factors and health problems, such as cancer. Among women who had quit smoking within the last 20 years, women with gum disease had a 36% higher risk of breast cancer than women who didn’t have gum disease. Among women who had never smoked, women with gum disease had a 6% higher risk of breast cancer than women who didn’t have gum disease. Among women who had quit smoking more than 20 years ago, women with gum disease had an 8% higher risk of breast cancer than women who didn’t have gum disease. Doing all that you can do to keep your breast cancer risk as low as it can be makes good sense. Besides exercising regularly, eating a healthy diet, maintaining a healthy weight, not smoking, avoiding alcohol, and taking good care of your teeth and gums are steps you can take to control several risk factors. Brushing and flossing your teeth every day to remove the bacteria that cause gum disease. Just being a woman is the biggest of all breast cancer risk factors. There are about 190,000 new cases of invasive breast cancer and 60,000 cases of non-invasive breast cancer this year in American women. While men do develop breast cancer, less than 1% of all new breast cancer cases happen in men. Approximately 2,000 cases of breast cancer will be diagnosed in American men this year. Women’s breast development takes 3 to 4 years and is usually complete by age 14. It’s uncommon for men’s breasts to fully form — most of the male breasts you see are fat, not formed glands. Once fully formed, breast cells are very immature and highly active until a woman’s first full-term pregnancy. While they are immature, a women’s breast cells are very responsive to estrogen and other hormones, including hormone disrupters in the environment. Men’s breast cells are inactive and most men have extremely low levels of estrogen. So hormonal stimulation of highly responsive and vulnerable breast cells in women, particularly during the extra-sensitive period of breast development, is why breast cancer is much more common in women than in men. Could Eating Pineapple 3 Times a Day Promote Breast Health? Do you have a problem with droopy and loose breasts? It is quite a normal phenomenon that occurs with age, but now you can easily change that, and all you need to do is to eat more pineapples. Smoking, excess alcohol and coffee can increase the problem, but pineapples can quickly solve it. After You Find Out What Pineapples Can Do To Your Breasts, You Will Never Stop Eating Them ! 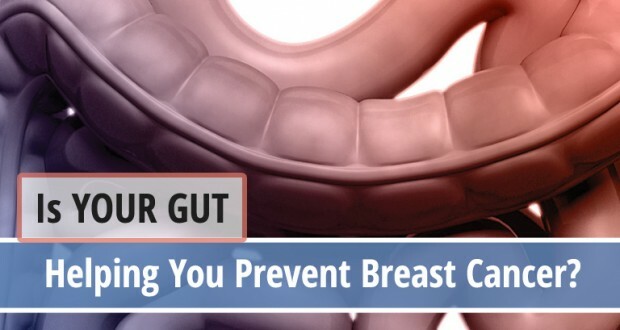 Is Your Gut Helping You Prevent Breast Cancer? Your gut, which houses your digestive system, contains over a billion nerve endings. It has more surface area than your external skin. It is the place where the majority of the absorption of nutrients and water takes place and it interacts with nearly 20 hormones in your body. It also contains 70% to 80% of your body’s immune cells. When it comes to Breast Cancer prevention and overall health, a Healthy Gut = a Healthy Body = Less Dis-ease, including cancer. Your gut is the home of all kinds of bacteria, both good and bad. Probiotics are “good” or “helpful” bacteria; “probiotic” literally means “for life.” They protect your digestive system from unhealthy, opportunist bacteria, viruses and parasites. To learn how your digestive health is connected to cancer prevention and overall health, let’s start with a visual of when things are NOT working well. We have all experienced the not-so-pleasant effects of a toilet backing up because of a paper clog or too much “you know what” in the bowl. Your colon is no different. It is like a sewer system and is designed to expel the waste matter from food and other metabolic processes. If you do not have healthy intestinal flora full of happy probiotics, your “sewer system” will literally back up into your body. What should be coming out gets re-absorbed and eventually will push through the intestinal wall and re-circulate into your blood stream. This plugging up of the digestive system also leads to increased toxicity in the body. And as the body becomes increasingly toxic, proper oxidation cannot take place on a cellular level. Without proper oxygen, the cells become stressed and your Immune System becomes compromised. In the early 1900’s, Russian scientist Ilya Metchnikoff suggested that disease and the aging process came as a result of “auto-intoxication” due to unhealthy bacteria that produced phenols, indols and ammonia in the gut. Improving intestinal flora with fermented foods that contained “lactic acid” bacteria seemed to have many health benefits; including, improving the immune system. Metchnikoff had also observed that certain rural populations in Europe, for example in Bulgaria and the Russian Steppes, who lived largely on milk fermented by lactic-acid bacteria were exceptionally long lived. Based on these facts, Metchnikoff proposed that consumption of fermented milk would “seed” the intestine with harmless lactic-acid bacteria and decrease the intestinal pH and suppress the growth of proteolytic bacteria. And just recently, a University of Michigan study indirectly linked healthy levels of probiotics and a healthy digestive tract to Immune System function in mice. Researchers in the study gave the mice lethal doses of chemotherapy drugs and at the same time gave them a substance called “Rspo1” or “R-spondon1.” 50-75% of the mice given Rspo1 survived the lethal dose. Why? Rpos1 produces stem cells that act like “‘super tissue regeneration machines.” These stem cells were able to rebuild damaged tissue faster than the chemo could destroy them.” The study used an injection of Rspo1 to activate stem cell production in the endothelial cells of the intestinal lining of the mice. Our bodies, however, (and the bodies of the mice) already possess the blueprint to produce this powerful substance if our intestinal flora is healthy. More than anything else, the presence of healthy, probiotic bacteria is what determines healthy gene expression in the epithelial cells of your intestinal lining. Although the University of Michigan study is questionable from a moral standpoint, since its aim was to prove that patients may some day be able to survive larger doses of chemo and radiation, an indirect consequence of the findings could be scientific proof of your own digestive tract’s ability to kick-start super-immunity naturally if given the ability to do so through the presence of healthy, probiotic bacteria. Essential #1 of The 7 Essentials™ System for healing the body naturally is to“Let Food Be Your Medicine.” This statement has never truer than with Probiotics. For thousands of years, fermented foods, the natural and nutritionally-based way to insure plenty of probiotic growth in your gut, have been a part of many cultures. Besides the Russian and Bulgarian peasants of Metchnikoff’s day that inspired him in his research, the Mediterranean and Middle Eastern cultures have credited their relatively low rates of chronic degenerative diseases to the daily use of fermented milk and vegetable products. The Asian culture also includes high-probiotic, fermented foods like miso and tempeh in their daily eating. They help fight inflammatory responses and reduce your risk of cancer. Start today to incorporateProbiotics through fermented foods and/or supplementation into your daily regime. If you are proactive with prevention by incorporating Probiotics into your life, you may be on your way to prevent Breast Cancer naturally. As an informed, health-savvy individual, you probably want to know what you need to look for right now in order to nip breast cancer in the bud. Instead of trying to deal with it after you’ve already been diagnosed – which hopefully will never happen! 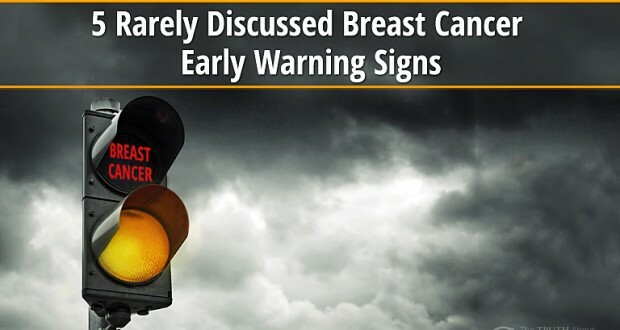 We’ve compiled a list of five early warning breast cancer signs, most of which are rarely talked about in the media, that you can use in your preventative arsenal to stay ahead of the game. The most common way that conventional doctors look for breast cancer in women is to identify lumps in the breast. They most often do this with mammogram x-rays. This offer physicians a basic roadmap for navigating the terrain of breast tissue, allowing them to pinpoint any lumps, masses, or other questionable abnormalities that might point to a malignancy. But mammograms can be a potential cause of cancer due to the ionizing radiation they send into breast tissue. They also aren’t accurate 100 percent of the time, despite what you may have been told. Lumps and masses in breast tissue can be either benign (harmless) or malignant (harmful), and mammograms don’t differentiate between the two. This often leads to false diagnoses and unnecessary treatments with chemotherapy and radiation. A better option, if you choose to undergo routine cancer screenings, is thermography. This unique screening method allows doctors to not only look for unusual lumps or growths, but also identify whether or not angiogenesis is taking place within the breast tissue. This is a much stronger and more accurate indicator that breast cancer may be present. Angiogenesis is a fancy way of saying new blood vessel growth, which may indicate that a woman’s body is trying to build a new supply system for blood to be delivered to developing breast tumors. Doctors who specialize in examining thermography images will be able to identify whether or not angiogenesis is taking place, and suggest a proper course of action. A lot of health experts like to talk about breast cancer as something that results from “bad genetics,” being passed down from mothers to their daughters. This implies that breast cancer can’t be avoided and occurs as an unfortunate “luck of the draw” type scenario. And depending on the type of breast cancer they’re talking about, there may be some merit to this popular theory. 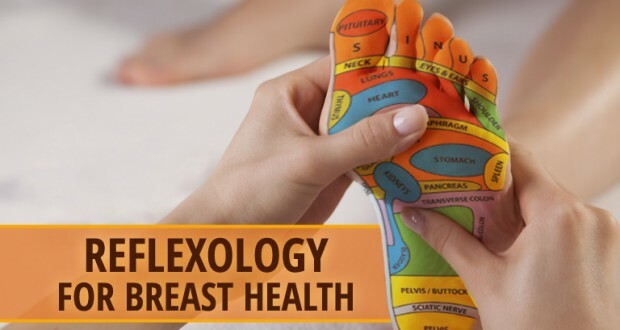 But most types of breast cancer are a result of environment, diet, and lifestyle, all of which dictate how a woman’s endocrine system produces and balances hormones. In other words, hormone imbalance plays a much greater role in determining breast cancer risk than many people think. Thermography can help qualified physicians determine whether or not a woman has an elevated breast cancer risk due to this often overlooked early indicator. Every woman’s body has a unique ebb and flow, and getting in tune with your own personal rhythm is invaluable for staying healthy. Paying close attention to any unusual changes that might be occurring, especially within breast tissue, is critical to avoid breast cancer. If you feel any unusual aches or pains in your breast, including occasional throbbing, pain, or even fluctuating discomfort, talk to your doctor. Many women assume that only an isolated lump with localized pain suggests the presence of breast cancer. The truth is that breast cancer can manifest as “scattered, seed-like” tumors that, in some cases, spread like small tentacles throughout breast tissue. Just be sure to look for patterns of change or any new and unusual symptoms that occur outside the norm. Occasional pain may not be indicative of breast cancer, but persistent itching, for instance, could point to fluid buildup, poor lymph function, or your body trying to create new blood vessels for breast tumors. Upper back pain that feels as though it’s coming from deep within the bones may be an early sign of breast cancer – but don’t assume that every occasional bout of soreness or back pain means you’re becoming the next statistic! Chronic back pain that doesn’t relent with stretching, chiropractic or other means may be a sign that breast cancer tumors are forming. Sometimes when tumors are developing in a woman’s breast, they put pressure on the ribs and spine causing new found and persistent pain. You need to be aware of any changes that occur in your spinal column, upper back, and eve2n neck. Talk to your doctor if you feel as though the pain you’re experiencing is unusually pronounced and marked by pressure from a possible internal growth. Nearly 75 percent of the adult “healthy” population is deficient in iodine, which has been shown to help ward off cancer cells in the breast and elsewhere throughout the body. Vitamin D is another risk factor in breast cancer. A 2012 study published in the Indian Journal of Endocrinology and Metabolism revealed that low vitamin D levels are a hallmark in women with breast cancer. Other studies show similar findings. A good rule of thumb in today’s nutrient-depleted world is to supplement with these and other cancer-fighting nutrients such as selenium and zinc. You may also wish to consult with a trained naturopath or integrative doctor. They can help you identify any specific nutrient deficiencies you might have and help you optimize your unique biological “terrain” for best breast cancer prevention. The diagnosis of breast cancer can send your mind spinning in a hundred different directions. Right after diagnosis, being in “panic mode” is normal. It is important, however, for you to step back at some point and simply process all the information. The more breast cancer treatments a radiologist administers, the more reimbursements he or she typically receives. This is known, in healthcare, as fee-for-service medicine — and lots of experts don’t like it, largely because it creates an incentive to provide as much care as possible, regardless of whether patients get any healthier. For ages, conventional treatment has been a five- to seven-week course of radiation after a lumpectomy. Women have to come see the doctor each day for breast cancer treatments, and doing that for over a month can be disruptive. But around 2008, researchers started publishing some great news: three weeks of higher-dose therapy could deliver equally good results for many patients. It has no worse side effects, and patients could spend less time and money on doctor’s visits. It seemed like a no-brainer to radiation oncologists too. In 2011, their trade group, the American Society for Radiation Oncology, found that the two options were “equally effective for in-breast tumor control and comparable in long-term side effects” for a huge percent of patients. This makes it all the more surprising that, three years later, new research published today in the Journal of the American Medical Association shows that the vast majority of radiation oncologists aren’t using the new treatment. The slow adoption of a faster and cheaper technology — one that delivers a better patient experience at a lower cost — isn’t just an issue with breast cancer treatments. It speaks to a lot of what’s screwed up in the larger American health care system. Doctors don’t have big incentives to stay up-to-date with new treatments. Sometimes, it’s actually financially ruinous for them to do so. The new research looks at the insurance records of thousands of women treated for early-stage breast cancer between 2008 and 2013. It uses the billing claims that their providers submitted to see what type of treatment they got. It finds that use of the new treatment — known as hypofractionation whole breast irradiation — definitely increased from 2008 through 2013, as more research came out proving its efficacy. In 2008, when there was nearly as much research as there is today, 10.6 percent of women for whom the new treatment was endorsed ended up receiving it. By 2013, that number had grown to 34.5 percent. That’s way more than 2008 — but also nowhere near a majority of patients getting a newer, faster, and equally good treatment as the older option. While the United States has made progress since 2008, for Emanuel, that one-third figure still raises the question: why, two years after national guidelines endorsed the new treatment, were most breast cancer patients not getting it? Why don’t doctors pick the better treatment? One cynical answer has to do with money: the more treatments a radiologist administers, the more reimbursements he or she typically receives. This is known, in healthcare, as fee-for-service medicine — and lots of experts don’t like it, largely because it creates an incentive to provide as much care as possible, regardless of whether patients get any healthier. The billing records that Bekelman, Emanuel, and their co-authors examined show that insurance plans were billed more than $4,000 more for patients who received the older, longer course of treatment than those who had the newer, shorter chemotherapy sessions. Patients also had slightly higher (about $100) out-of-pocket costs for radiation-related expenses. And there’s also the role of old habits being hard to kill, and radiologists relying on the same treatment they’ve used for years now. Yes, it is a bit more expensive and inconvenient for patients, but there’s no evidence that it’s actively harming their health. “If you don’t take into account convenience, costs to patients, and costs to society, you can tell yourself that it’s not the worse option,” says Emanuel. This could be true not just on the part of oncologists but on the part of patients, too, who might assume that the longer, more expensive course of treatment has to be better. In most other things we shop for, like cars and vacations, bigger and more expensive generally means higher quality. Why wouldn’t health care be like that too? The financial incentives, the doctor preference, and patient attitudes — all of these add up to American women getting worse breast cancer care than women in other countries. In Canada, for example, more than 70 percent of eligible patients receive the new treatment. That’s double the rate here in the United States. This isn’t an issue limited to breast cancer care. The American health care system is replete with examples of doctors providing care that doesn’t help people get better — care that wastes time, money, and energy on the part of patients and providers. Medicare, for example, spends an estimated $1.9 billion on care that study after study shows doesn’t make people healthier. And by rewarding volume over value, the American health are system makes this type of unnecessary, unhelpful breast cancer treatments especially easy to provide. The incentives are all there to encourage doctors to provide more care, even if, like the older breast cancer treatment methods, it isn’t the best choice for the patient. (Article Excerpt and Image from How we treat breast cancer exposes a huge systematic issue in American health care, December 10, 2014, www.news.yahoo.com).